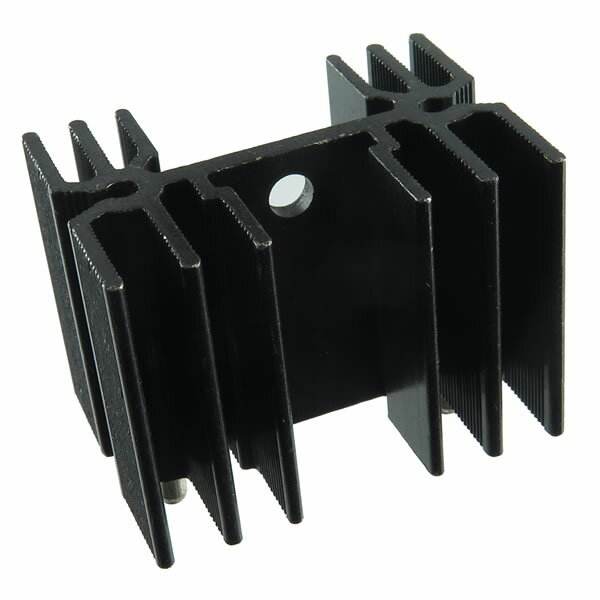 G23590 - TO-220/218/247 Black Anodized Heatsink with Pins 1.38" x 1"
TO-220/218/247 Black Anodized Heatsink with Pins 1.38" x 1"
Black anodized aluminum omnidirectional fin heatsink for TO-220, TO-218 or TO-247 devices. Measures 1.38" (35mm) wide x 1" (25.4mm) deep x 1" (25.4mm) tall. Has a 0.14" (3.6mm) diameter hole (6-32 size) for attaching to your device. One side has a 0.525" (13.3mm) gap and the other has a 0.80" (20.5mm) gap. For vertical mounting with solderable pins. Pins are on 1" centers (pitch). May have slight cosmetic marks as they came to us in bulk.